Let me show You something.. It happened on 19 August 2009, Wednesday , which was the eve of Chinese Hungry Ghosts Festival. Chinese folks were preparing Prayer Materials and Food Offerings since morning until evening and getting ready to welcome the Ghosts from Hell when the clock strike 12 midnight. Since it was going to be the start of Chinese Hungry Ghosts Festival that night, I met up an old Taoist Sorcery Master, whom I know for a long time since I was still a Kid, in the afternoon for a chat over coffee session. He handed me a "scratch it" 4D Lucky Numbers Card, which he created himself and also empowered with "god of wealth come visiting" talisman at the back of the scratch card. He gave it to me as a gift and said " If You believe in ghosts, You buy the numbers shown after scratching it". As a Taoist Sorcery Practitioner myself and he is someone I look highly upon and respect him a lot, I 100% believe whatever "magic trick" he does. I scratched the card and went to buy the 4D Lucky Numbers for that day, which was Wednesday and was also a 4D Draw Day. The 4D Numbers shown on the card was 1007. At night, it came out on Singapore Pools as 0701 - 3rd Prize. I don't have to tell You how much I bet on it and how much I strike. You just think if You already 100% sure that it will confirm strike, how much will You bet on the Numbers? While checking on Malaysia Magnum 4D , it came out as Direct 1007 - 3rd Prize on the same night. Will You still consider "By Luck" when Singapore side and Malaysia side hit same numbers on 3rd Prize on the same night? 4D Numbers given on the Scratch it card 1007 , means it was 1st day of 7th lunar month (Hungry Ghost Festival). 0701 also means 1st day of 7th month (Hungry Ghost Festival). How You Can Strike 4D for Yourself on Chinese Hungry Ghost Month? If You 100% believe that ghosts exist or think that there are even more ghosts on Hungry Ghosts Month and want to seek help from Ghosts , or mutually help each other (or use each other), it is one of the best time to seek 4D numbers during this period. 1) The best time to seek 4D Numbers will be at 12am - 1st Day of Chinese Lunar 7th Month, when the hell gates just open. 2) 2nd Best time is 15th Day of Chinese Lunar 7th Month. 3) The 3rd best time is during the end of Hungry Ghost Festival, before the closing of Hell Gates - before 12am of 30th Day of Chinese Lunar 7th Month. During 1st Day or Last Day of Hungry Ghosts Month, You can do Simple Food Offering Method. Go to the glass patch outside Your house or near the road junction , best is if You can go to Graveyard if You dare. Display the Simple Food Offering on the ground and also place the joss papers and hell bank notes at the side and then light up 2 candles and joss sticks to pray to the "Good Brothers" (wandering ghosts). While the candles and joss sticks are still burning , kneel down and use the "Shake a Cup for 4D Numbers" Method (Bring Your Shake Cup along) and get Yourself a set of 4D Numbers to buy. On 15th Day of Hungry Ghosts Month, You can do Grand Food Offering Method. Place a table right in front of Your Main Door of Your House or Shops / Company / Shop. Display all kinds of meats, canned foods , rice , packet drinks, beers and whatever You think can be a big feasts. Poke a Triangle Flag (with Dragon Image) or one incense stick on each food , representing the food is to be offered to the Wandering Ghosts. 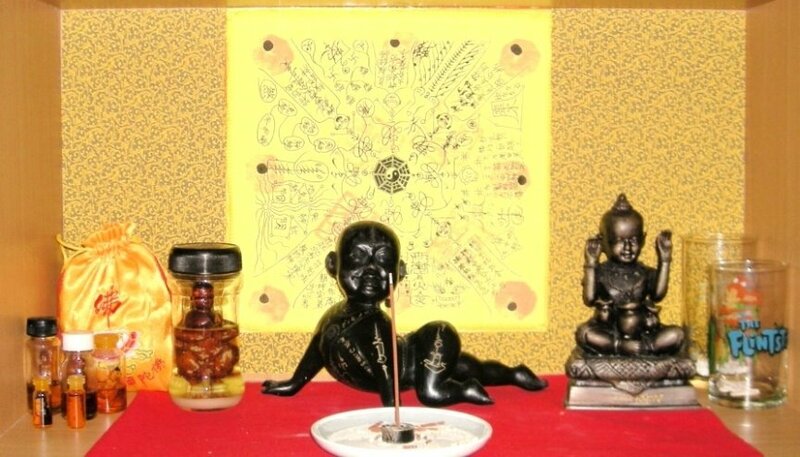 After that, place the joss papers and hell bank notes at the side and then light up 2 candles and joss sticks to pray to the "Good Brothers" (wandering ghosts). While the candles and joss sticks are still burning , kneel down and use the "Shake a Cup for 4D Numbers" Method (Bring Your Shake Cup along) and get Yourself a set of 4D Numbers to buy. After seeking 4D Numbers from the Wandering Spirits and the candles and joss sticks are almost complete burning, You can begin to burn the Joss Papers and Hell Bank Notes to them (ghosts). After that, pack up the Food Offerings and share the food with family members, working colleagues, Business Partners or workers. When You strike 4D Big Big (if small amount never mind), don't forget to go back to the same spot where You ask 4D and thank the ghost or ghosts whom help You strike 4D, by burning Joss papers , Hell Bank Notes and food offerings once again. And also don't forget to send Ang Bao or "Token of Appreciation" to the person who shared with You this Secret To Strike 4D On Chinese Hungry Ghost Festival. Western Folks who want to burn offerings to Ghosts during Chinese Hungry Ghosts Festival for the fun of it or and for the sake to seek their help for Lottery Numbers, but can't get hold of Joss Papers, Hell Bank Notes and Prayer Materials can Email: super.kumantong@gmail.com to buy Standard package of Prayer Offerings for "Wandering Brothers" during Hungry Ghost Month. The Prayer Offerings Package will be much more expensive than what You buy at Joss Paper Shops, as inside will contain "Secret Ingredients" (example: Strike Lottery Talismans and more) not found anywhere else, to boost up the Strike Lottery Chance.